Has it been 15 years? 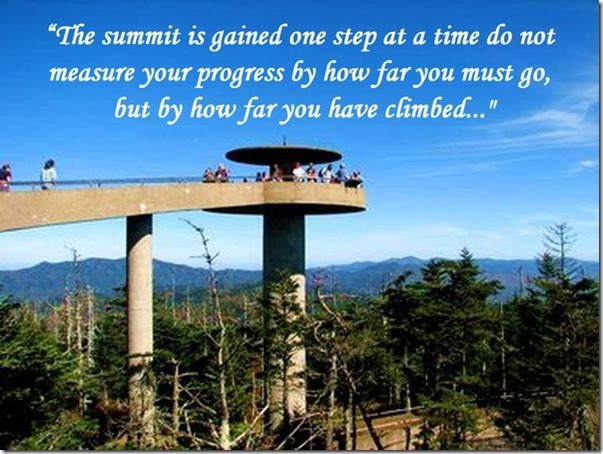 In August of 2000 my wife, Patti and I began a walk to the top of Clingman’s Dome in the Great Smoky Mountains. Perhaps today you will face a Clingman’s Dome. It will probably not be a mountain in Tennessee. But it will be a mountain on your path through life. It may be the failing health of a loved one or your own failing health. It may be a financial mountain. It may be a broken relationship or a shattered dream. Perhaps you be trying to break an addiction of some form. Whatever the mountain may be it will tower over your life and will cast a long shadow. The ascent will not be easy but it will be one that must be made. There will be those who will discourage you. There will be times when you will seem alone. The steep climb and the hot sun will rob you of your strength. You will want to quit, but you can’t because the beauty of life awaits you on the summit. Look around there those who walk with you, they comfort you, and they strengthen you. Look around and see the beauty that is hidden from the low lying areas of life. Listen to the gentle whisper of the Creator as he beckons you ever upward to the top where life will become so beautiful, so wonderful it will defy description. As you begin your assent the Creator joins in Inch by, step by step the you slowly make your way up the side of the mountain. The path is not easy, it is steep, the air is thin, and the sun is hot. “You’re not going to make it,” your tired and aching body screams. Yet the ascent goes on. Every time you stop to rest and the view gets better and better leaving you spellbound. “I must go on the best is yet to come,” you hear yourself saying. Inch by inch, step by step the journey continues. Soon the heat of the blazing sun and the thin air render continues to tire and weaken you. “You’ve got a long way to go,” someone says. “The going gets rougher and rougher,” another says. Words of discouragement weight heavily and doubt begins to set in. Suddenly in the thin mountain air the voice of the Creator whispers, “The summit is gained one step at a time do not measure your progress by how far you must go, but by how far you have climbed. When you become tired stop and rest and I’ll strengthen you, do not give up because I’m walking with you and await your arrival.” And then minutes later standing on the top of the world you look up and see God smiling on you, “Welcome to my world,” he says. Do not fear the climb, fear only not beginning. Never think you’ll not succeed for success is gained one step at a time, no matter how small the step may be. Do not give up because God will never give up on you! Thank you so much for posting this today. I was up praying all night and feeling not much hope but I kept praying for a break through! Again I thank you. True words helped me to see that every step counts. I often feel defeated when I make a mistake and then I quit trying. This gave me clarity. May our Good Lord bless you friend!! !